Pull-ups are a popular compound bodyweight exercise that targets multiple muscle groups, especially the back, shoulders and biceps, which makes them an essential part of any training routine. They’re also very versatile – once you’ve mastered the regular pull-up, you can experiment with the grip width in order to achieve specific results. 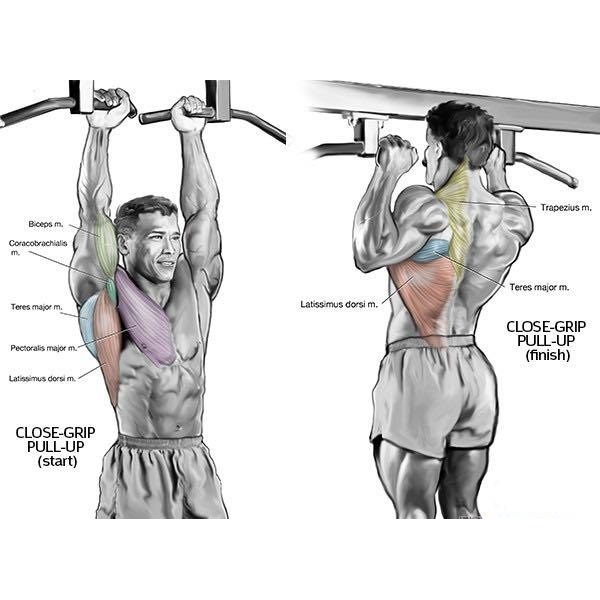 That being said, the target muscle of both wide-grip and close-grip pull-ups is the latissimus dorsi that runs from the side of the torso to your spine, but the wider the hand position, the stronger the emphasis on the outer lats. And no matter how you feel about them, it’s a fact that close-grip pulls are one of the best ways to work your lower lats. But the story doesn’t end there. The muscles recruited during a close-grip pull-up include the intrinsic muscles of the hand, the forearm and upper arm muscles that directly support the pull, as well as the upper back muscles and deltoids that are necessary to maintain it. The pull itself extends the humerus bone and activates the latissimus dorsi, teres major, pectoral and trapezius muscle group. Let’s take a closer look at the anatomy and mechanics of these greatest targets of the close-grip pull-up. The latissimus dorsi is a major upper back muscle that connects the vertebrae in the thorax and lumbar regions and the iliac crest of the hip bone to the humerus bone of the upper arm. During a close-grip pull-up, this muscle is responsible for keeping the humerus in an adducted position (bringing the arm towards the center of the body). The maximum activation of the upper fibers of the latissimus dorsi happens when the hands are pulled towards the axilla from their starting position which is above shoulder height. The upper fibers of the large trapezius of the upper back run all along the posterior base of the skull and the cervical vertebrae of the neck, attaching to the lateral part of the clavicle and along the spine of the scapula. The middle fibers of the trapezius begin on the upper thoracic vertebrae and run to the spine of the scapula. During a pull-up, the upper fibers of the trapezius are responsible for pulling the clavicle upwards, while the middle fibers pull the scapula towards the vertebrae. The sternal-costal head of the pectoralis muscle originates at the lateral manubrium, the six sternum costal cartilages and the eternal oblique aponeurosis and it inserts at the humerus. Both the sternal-costal and clavicular heads of the pectoralis major are responsible for the adduction, medial rotation and transverse flexion of the upper arm. At the beginning of the close-grip pull-up, the pectoralis major gets activated to adduct the humerus. Step on a box that will allow you to grab a pull-up bar. Grab the bar with a shoulder width grip (or slightly narrower), the palms facing away from your face. Pull yourself up by flexing the elbows and extending the arms until the bars is adjacent to the upper part of your chest and try to get your body as high as possible to achieve optimal contraction of the muscles included. After reaching the peak position, lower yourself in a controlled and slow manner until you return to the original position. Repeat. Keep in mind that you can use several grip styles in a pull-up to strengthen specific muscles or to get better at different movements. Therefore, it’s best to perform them all with proper form for optimal results in all body parts. The wide-grip pull-up offers a higher degree of difficulty with a greater mechanical advantage, but on the other hand it puts more stress on the shoulder joints. The close-grip pull up offers greater stability and reduces the risk of injury, while effectively activating the same major muscle groups of the upper body musculature as the wide-grip variant and providing a greater engagement of the biceps to assist the motion.